Former Apple Ad Man Slams 'Genius' TV Spots as "Landing With A Thud"
Ken Segall was a creative director at TBWA\Chiat\Day and worked with Steve Jobs for years, including at NeXT and Apple. He wrote a book about his experiences called Insanely Simple that posited "Simplicity" as the driving force behind everything Steve Jobs did. In a post on his personal site, Segall dissects the new 'Genius' television ads that Apple began running during the Olympics last Friday. I know it’s hard to say after viewing the new batch of Mac ads that debuted on the Olympics. I’m still in a bit of shock myself. Sure, Apple has had a low point or two in its advertising past — but its low points are usually higher than most advertisers’ high points. This is different. These ads are causing a widespread gagging response, and deservedly so. 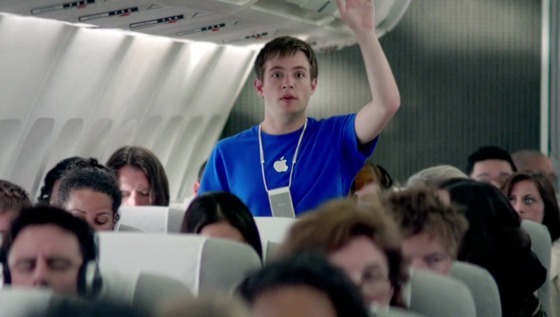 I honestly can’t remember a single Apple campaign that’s been received so poorly. He finishes by pointing out that no one can know what Steve Jobs would have done, and it's a foolish question to ponder. None of us can possibly know what Steve would do. Steve was a master marketer, but he was also perfectly capable of a lapse in judgment. It’s unfortunate that this campaign is appearing now, nine months after Steve passed away, because the timing only fuels the argument that everything will crumble now that Steve is gone. I don’t buy that. One of the ads, 'Basically', is embedded above. 'Labor Day' and 'Mayday' are viewable on YouTube. Agreed. the ads weren't all that. These ads are terrible. Can't believe Apple did this. I don't like these ads at all. They're not great, but they're not THAT bad. Raised a little chuckle, which is more than most ads do. I thought they were cute... I think the Apple community is hypercritical to be honest. I enjoyed them. I'm really not sure how these made it through to the air. They are pretty bad...especially the two non-airplane ones. My guess is they'll pull them from the air this week if not today and we'll see the Siri/iPhone ads back on immediately. I would take ANYTHING Ken Segall says, with a grain of salt. All Ken is trying to do is SELL BOOKS with his comments. Nothing more. His comments are an ADVERTISEMENT for his book. These ads are indeed, horrible.